On November 25, 1882, the Vulcan Street Hydroelectric Central Station began operation. 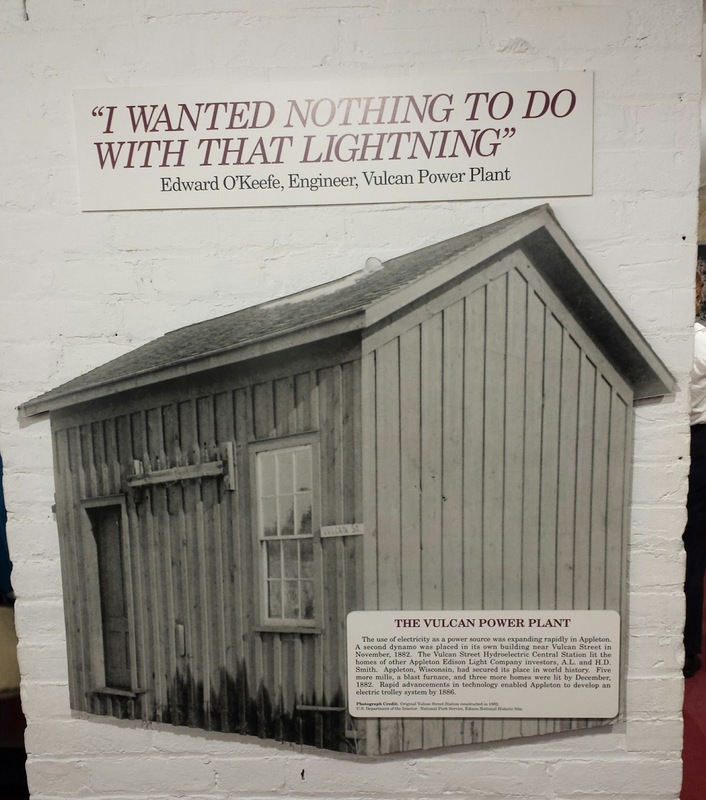 The Vulcan Street Plant featured a direct-current Edison “K”-type dynamo and lit the homes of A. L. and H. D. Smith, five or six mills, a blast furnace, and other nearby homes with Edison bulbs. 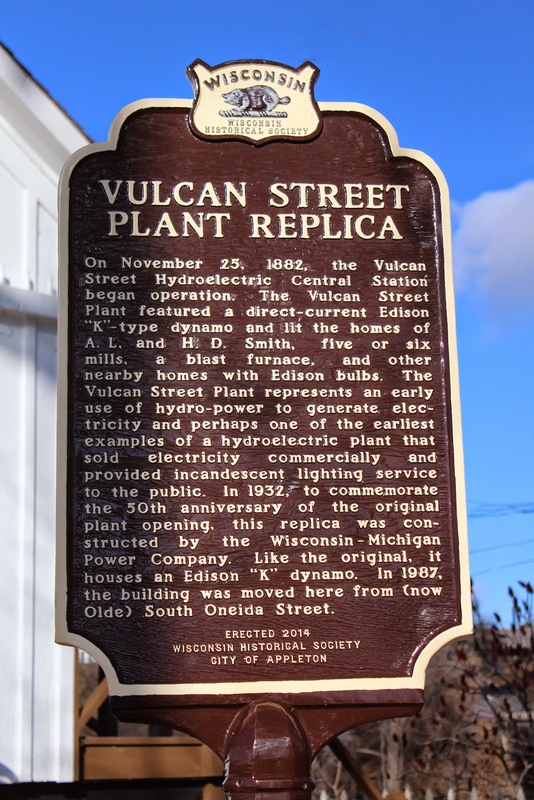 The Vulcan Street Plant represents and early use of hydro-power to generate electricity and perhaps one of the earliest examples of a hydroelectric plant that sold electricity commercially and provided incandescent lighting service to the public. In 1932, to commemorate the 50th anniversary of the original plant opening, this replica was constructed by the Wisconsin-Michigan Power Company. Like the original, it houses an Edison “K” dynamo. In 1987, the building was moved here from (now Olde) South Oneida Street. 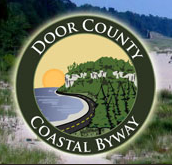 The marker is located adjacent to the south bank of the Fox River, and is accessible at the northernmost end of South Vulcan Street, north of its intersection with East Island Street, Appleton, Wisconsin 54915. H.J. Rogers' home, now known as Hearthstone Historic House Museum, is located on the bluff above the park. In 1882 it became the first home in the world to be lit by a hydroelectric central power station using the Edison system. Visitors to this beautifully restored historic home can view the original light fixtures (right) as well as a series of exhibits highlighting the home's and the riverfront's rich past. The use of electricity as a power source was expanding rapidly in Appleton. A second dynamo was placed in its own building near Vulcan Street in November, 1882. The Vulcan Street Hydroelectric Central Station lit the homes of other Appleton Edison Light Company investors, A.L. and J.D. Smith. Appleton, Wisconsin, had secured its place in world history. Five more mills, a blast furnace, and three more homes were lit by December, 1882. Rapid advancement in technology enabled Appleton to develop an electric trolley system by 1886. Photograph Credit: Original Vulcan Street Station construction in 1882. U.S. Department of the Interior, National Park Service, Edison National Historic Site. The above photograph is on display at nearby Hearthstone Historic House Museum. 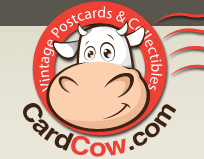 See also, Hearthstone Historic House Museum, at a nearby location. View of the Fox River from the marker location. with East South Island Street. 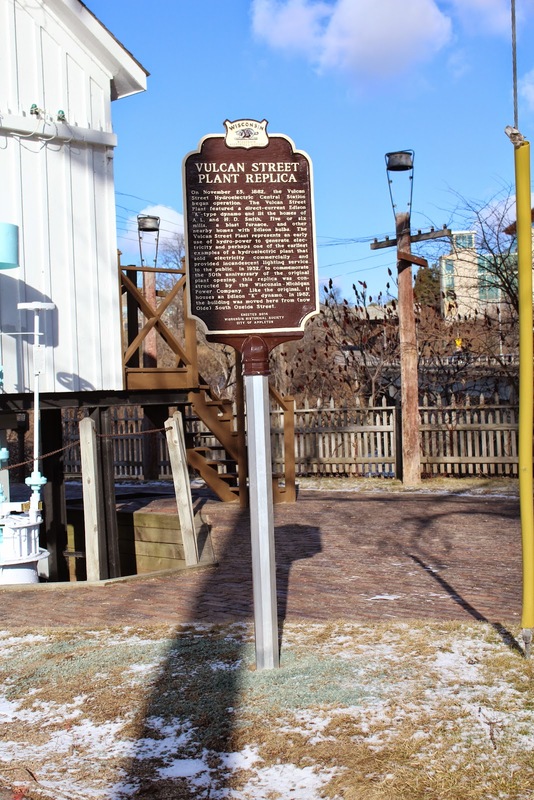 Vulcan Street Plant Replica and marker are located in Appleton, Wisconsin.